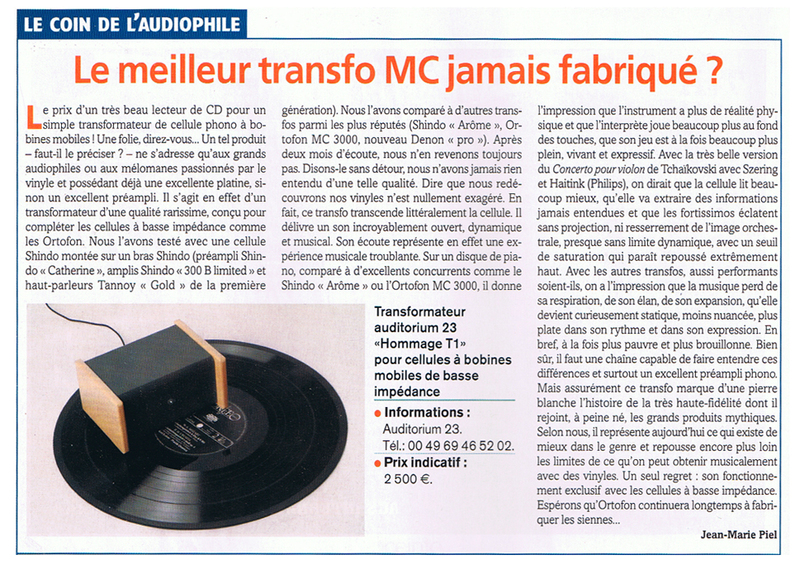 The price of a very good CD-player for a simple MC-transformer! Crazy, you'll say. A product like this is certainly only made for audiophiles or hifi maniacs dedicated to vinyl, possessing an excellent turntable or even an excellent preamplifier. In fact we are speaking about a transformer of rarely to find qualities, made for cartridges with low impedance like for example Ortofon. We have made the test with a cartridge of Shindo Laboratory mounted on a Shindo tonearm, amplification was Shindo preamp "Catherine" and Shindo poweramp "300 B Limited" with Tannoy "Gold" speakers of the first generation. 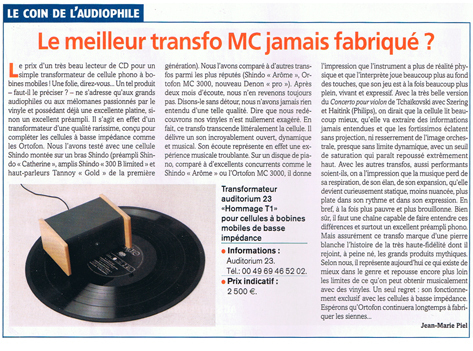 We compared the transformer to some others of highest reputation (Shindo "Arome", Ortofon MC 3000, new Denon "pro"). Without exaggeration we can say that it was simply the rediscovery of our vinyl collection, in fact this transformer literally transcends the cartridge. It delievers an unbelievable open tone with respect to both dynamics and musicality. The listening becomes a moving experience. In comparison to the competitors like the Shindo "Arome" or the Ortofon 3000, the Hommage T1 gives the impression instruments have more physical realism, the keystroke of the pianist is more distinctive, the play more authentic, vivid, expressive. The wonderful recording of Tchaikovski's Concerto for Violon with Szering and Haitink (Philips) makes one believe in a better reading of the cartridge that extracts informations never being heard before. A fortissimo enfolds unlimited and without diminution of the orchestral image, almost without dynamical limitations, the limit of saturation appears to be moved extremely high. The other transformers - as excellent as they are - give the impression that the music is losing respiration, swing, extension, it suddenly appears more static, less nuanced, more flat in rythm and expansion - briefly said, the music seems likewise poorer and less ordered. Of course, it requires a system and especially a preamp that is capable of making the differences audible. But for sure this transformer is a milestone and joins immediately the mythical products in the history of hifidelity. For us it is not only the best transformer, it also means a new definition of the musical possibilities in analog reproduction. The one regret: it's made only for cartridges with low impedance, let's hope that Ortofon will keep on the production for yet a long time.